A heavy fall of snow, heaviest währ. Dienstag abend. Freeze-thaw conditions (maximal 2°C am Donnerstag nachm., min -2°C am Dienstag morg.). Mainly frischer Wind. A moderate fall of snow, heaviest am Freitag abend. Freeze-thaw conditions (maximal 1°C am Freitag morg., min -6°C am Samstag abend). Wind will be generally light. Die Table oben zeigt die Wettervorhersage für Val Gardena auf der angebebene Höhe von 2518 m. Unsere ausgeklügelten Wettermodelle ermöglichen uns die Schnee-Vorhersage für die Gipfel-, Mittel- und Bodenstationen für Val Gardena. Das Fenster über der Tabelle ermöglicht das Abrufen der Wettervorhersage für andere Höhen. Für einen umfassenderen Blick auf das Wetter, siehe die Wetterkarte" von Italy. 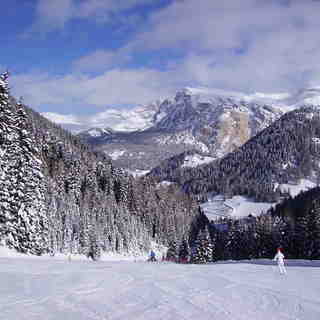 Stayed at the Hotel Alpino Plan in Selva mid January this year and had a superb week's skiing. 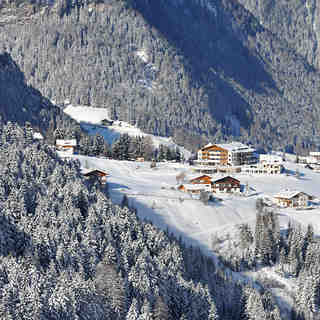 Snow was very late coming this year but the snow making was fantastic so pistes were in fabulous condition. We had clear blue sunny skies for four days and a few clouds high up on the other days so perfect visibility on largely uncrowded slopes, but very cold. Did the Sella Ronde clockwise in a morning. It is a vast area where it seemed you only needed to ski the same run twice to either get somewhere or because you enjoyed it so much you wanted to do it again. Some really long runs; we particularly liked Colfosco and Corvara. Runs coming back into Selva from St Cristinia side were tricky in the afternoon after the shade hit the mountain. Couldn't get to the Hidden Valley because of the lack of snow lower down but that was about the only negative thing in the week. Food and drink much cheaper than the 3 Valleys. Very little off-piste though; suited us, we are very competent geriatrics. We clocked up about 130 miles in the week with virtually no queues.